The busy seaport scenic panorama book : with picture models of ships, et cetera, for arranging in position. A Tuck movable fold out panorama book, complete with all original movable figures. Complete with all slots filled by original corresponding figures. This panorama was published with an “extra piece” – There are two choices for the big ship that fits into slots 36. This copy is complete and contains the extra piece! 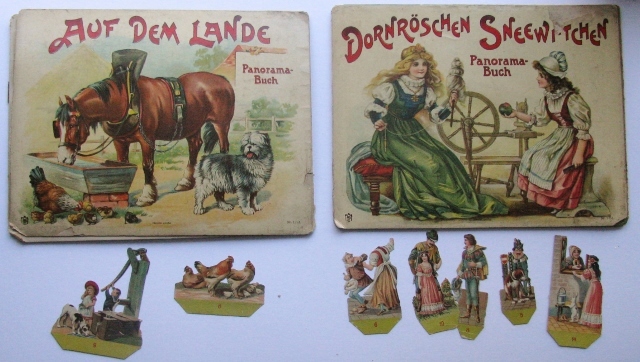 4 plates in concertina form that stand up to create a large panorama with numbered loose figures.The die cut punch out characters fit into numbered slots in the panorama to complete the image, which consists of four hinged folding panels. On the reverse of slot plates is a story. Rear panel is designed as a pocket to hold the figures when not in use.